Nutanix, Inc. (NASDAQ: NTNX), a leader in enterprise cloud computing, recently announced their financial results for its third quarter of fiscal 2018, ended April 30, 2018. Reconciliations between GAAP and non-GAAP financial measures and key performance measures are provided in the tables of this press release. Acquired Netsil, Inc.: Completed the acquisition of Netsil, Inc., a provider of application discovery and operations management that enables state-of-the-art observability in modern distributed cloud environments. Executed on Transition to Software-Defined Business Model: Grew software and support billings by 67 percent year-over-year, including three software and support deals worth more than $5 million each. Pass-through hardware billings decreased to 17 percent of total billings in the quarter, down from 25 percent in the year-ago quarter. Improved AHV Penetration: Grew adoption of AHV, the company’s built-in hypervisor, to 33%, based on a fourquarter rolling average of nodes using AHV as a percentage of NX nodes sold. 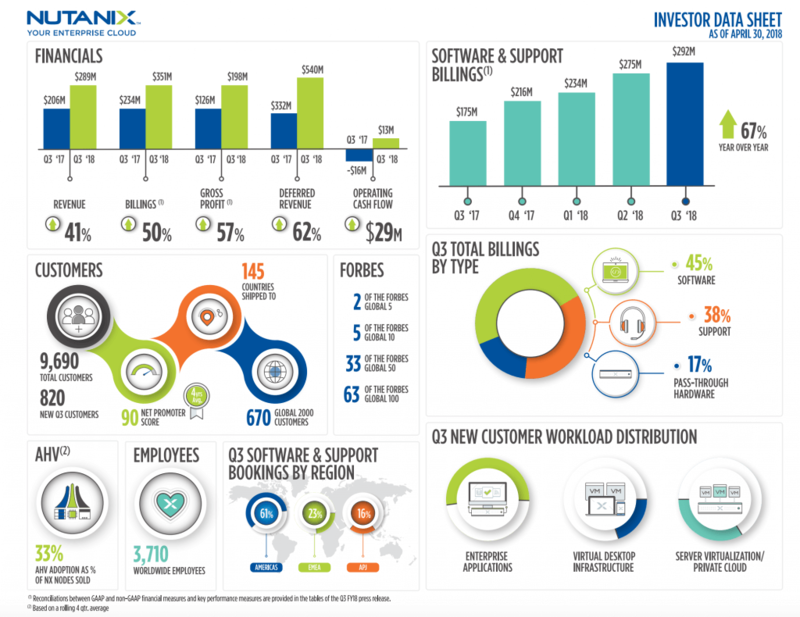 Expanded Customer Base: Nutanix ended the third quarter of fiscal 2018 with 9,690 end-customers, adding 820 new end-customers during the quarter and growing deals greater than $1 million by 28 percent year-over-year. Nutanix Flow, which completes its core infrastructure services offering and provides customers with a software-defined networking solution for the multi-cloud era. Nutanix Flow solves customers’ security concerns through a unique application-centric focus combined with native virtual machine (VM) microsegmentation that protects against internal and external threats. Nutanix Era, which expands on the company’s platform services offering. Beginning with Copy Data Management (CDM), Nutanix Era empowers database administrators to clone, restore, and refresh their databases to any point in time leveraging a virtual time-machine. Copy Data Management, along with other planned offerings from Nutanix Era, enables companies to address the complexity and cost of data sprawl with a sophisticated service that makes complex database operations simple. Nutanix Beam, which introduces the company’s first software-as-a-service offering to the market. Nutanix Beam enables IT managers to visualize, predict and manage cost, security, and regulations across multiple clouds. This offering helps application owners with the unexpectedly high costs of their cloud services and the lack of visibility and control of their service consumption. Increased Participation in 4th Annual .NEXT Conference: Nearly 5,000 attendees with 35+ customer speakers, 40+ partner sponsors, and keynote addresses from visionaries including Anthony Bourdain and renowned TED talk speaker Dr. Brené Brown; partners including Jason Lochhead, CTO, Infrastructure, Cyxtera; customers including Vijay Luthra, SVP, Global Head Of Technology Infrastructure Services, Northern Trust – Chicago; and strategic alliances including Brian Stevens, Chief Technology Officer of Google Cloud. Additionally, the company hosted 20,000+ attendees at .NEXT events around the world over the past year. Hired New MD of Operations in India: Hired Sankalp Saxena as Senior Vice President and Managing Director of Operations of its India subsidiary to lead its India operations and execute on the company’s growth strategy, including product innovation, talent acquisition, and brand building. Named as a Top Public Cloud Company to Work For: Glassdoor and Battery Ventures ranked Nutanix one of the top 10 public cloud computing companies to work for in a recent report. Non-GAAP net loss per share between $0.20 and $0.22, using 171 million weighted shares outstanding. *The elimination of hardware revenue is based on the estimated cost of hardware in transactions where our customers purchase such hardware directly from our contract manufacturers. Supplementary materials to this earnings release, including the company’s third quarter fiscal 2018 investor presentation, can be found at http://ir.nutanix.com/company/financial/.